QVENC - H.264 IP Professional Video Encoder | AdvancedDigital Inc.
and decoding for Content Gathering, Monitoring, and Distribution of broadcast quality video over IP networks. 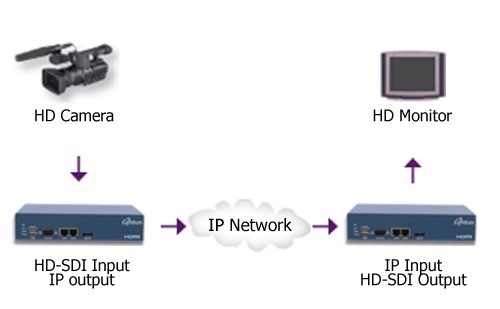 QVENC’s advanced video transport couples broadcast and networking standards with patented error correction to take advantage of the inherent flexibility of IP and the Internet, providing broadcasters an efficient, affordable and scalable solution for professional quality video distribution quality over nearly any IP network. The QVENC provides H.264 High Profile video compression, up to 1080p50/60, along with support for up to 4 audio channels, multicasting and multi-unicasting, and closed captioning to allow cost-effective audio/video broadcast and IPTV solutions. 7 VDC to 18VDC Power Input directly or through AC Power Adapter. Incorporates QVidium’s Patented feed-back based error correction (ARQ): QVidium’s ARQ provides the most reliable video transport over any IP network, including wireless and unconditioned IP networks. Designed for Professional Broadcast Applications: Includes advanced CEA-708/CEA-608 Cosed Captioning, Dolby(R) AC3 Passthrough, and AES128 Encryption features. Simple interconnect: Gigabit Ethernet interface allows simple interconnection to most network equipment for management. Easy to Manage:Easy to manage through web-based user management and SNMP Traps. Reliable: Designed for 24/7 operation. QVDEC – HD/SD H.264 and MPEG-2 decoder with HD/SD-SDI, HDMI and CVBS outputs. Please click on “QVENC Datasheet” for technical specifications.